Welcome to the UStamp with Dawn and Friends!! World Showcase Blog Hop. If you have been following the Blog Hop from the beginning, you have just been wowed by Ilina’s purse and card set. Wasn’t that just the cutest thing?? If you are just joining the Blog Hop, no problem as you can start at any point. All the Designer’s Blogs are linked together so you will be able to see ALL the super projects we have for you. The project I have to share with you features a few easy techniques that will give any project a vintage feel. As a Special Thank You for stopping by my blog I am giving away BLOG CANDY!! Please leave a comment about my project to be entered for a chance to win a FREE PASS to the next UStamp with Dawn and Friends!! session – I ♥ the Holidays!! I will randomly select a winner to be announced on Monday, so please check back to see if you are the lucky recipient. If you have already joined I ♥ the Holidays!! for the Special Party Pricing and you are selected as the winner, you will get a FREE Pass to the NEXT event after I ♥ the Holidays!! which will launch in the Fall. AND now for the really cool part!! You will NOT want to miss out in THIS!! THE WORLD SHOWCASE BLOG HOP WEBSITE!! Yes!! It is all FREE, so tell all your friends and join the fun with UStamp with Dawn and Friends!! AND last but certainly not least, please hop on over to NEXT BLOG where you will find Erica with a great summer fun party favor to show you. this is a very cute card. I don’t own this stamp set but like it. Love the clean and simple lines of your card, sometimes c & S are the way to go. This is my type of card! Mailable! 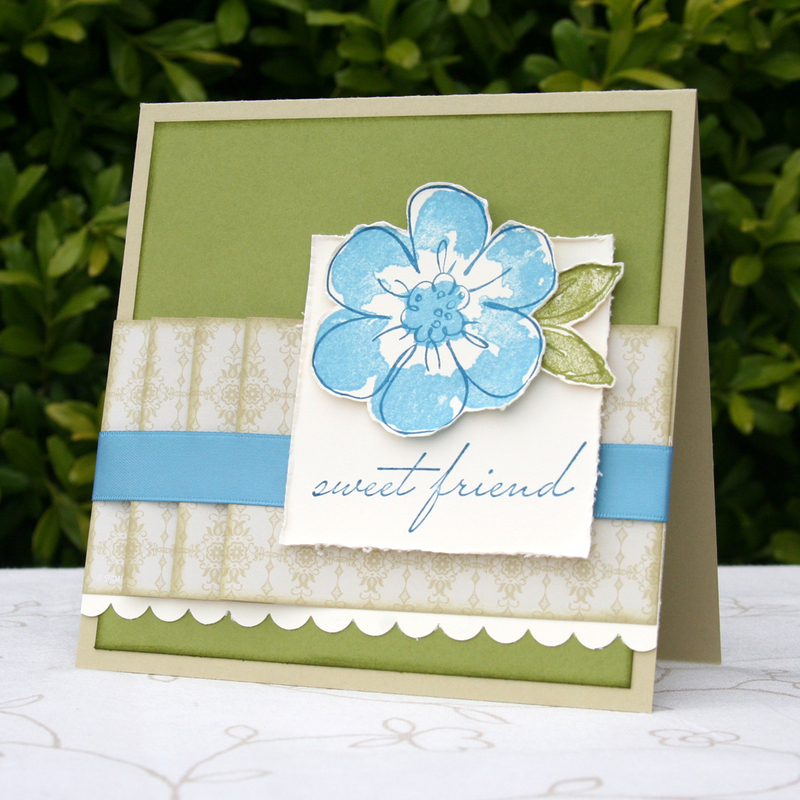 Love the color combination and the distressing on this card! Very pretty! I love your card- perfect to case for my mom! I can’t wait for the holiday ideas…. Cute card. Thanks for sharing and the chance to win. This stamp set really does set so many moods. Love the versatility of it. Also love the idea of pleated paper and your inking. Thanks for sharing – a great card to case. Jessica–What a lovely card made with one of my favorite stamp sets! Thanks for sharing! I love that you used dsp instead of ribbon very nice and elegant. I think this is a beautiful card! It has that simple but elegant look! Thanks! Such a simple elegant vintage feel to this card, love it. Thanks for sharing your project and the chance for blog candy. This is such a versatile set. Love the sponging. Great vintage card. Thanks for sharing. Love this card. These two colors are beautiful together. Thank you for sharing. I love this card…it’s so elegant! I’m a big fan of your work, and you did it again with this card! Now I am not one for vintage but love your card, I definitely will be making one. Love the layout and design of this card. this is simply stunning,very feminine! A lovely card, I like how you have layered the DSP and inked the edges. Beautiful card, will be making it soon. Very nice way to feature that beautiful blossom. What a super card …. love the paper pleating, adds a very lovely element to a simple, yet elegant card. Love it!!! I love it Jessica. Thanks for the inspiration. Thanks Julie – you should be able to download the technique instructions from the Blog Hop Member page. Click on the large Blog Hop Blinkie to sign in. P.S. How can I UNCLICK the button so I dont get all your replies? YIKES! LOL and I just cant delete them…I have to open up every one of them then delete! UGH! THX! Beautiful… as usual. You always do just the right amount of sponging. I’ve not signed up for the next Ustamp so I hope your random number generator picks me! Hi Jessica, this is so elegant looking. I will definitely have to give this a try. TFS such a pretty card. Love the color choice, the stamp set, everything. Thanks for sharing your creativity. This card is so pretty. You used my favorite color combination. Thank you for sharing your awesome card and for offering blog candy. Love the project and design. Thanks for sharing and the candy! Love the softness of the beauty! So pretty and I love the soft colors! Thanks for sharing!!! This is so cute! TFS! Love the Simple Elegance of your card…Great Color Combo! Looking forward to recreating…TFS! I am such a sucker for simple elegance! I love the blue and the green together. Thanks! I love those colours – so classical! Hi!, I´d just found your Blog about the BLog Hop. I´ve look for the other project´s here on your side and I am now a big fan of you. I´ll be not the last time, that I´ve visit your side here. Hallo, ich habe gerade Deinen Blog ueber den Blog Hop gefunden. Deine anderen Projekte habe ich mir auch angeschaut und nun bin ich ein grosser Fan von Dir. Dies wird nicht das letzte mal gewesen sein, dass ich Deine Seite besucht habe.